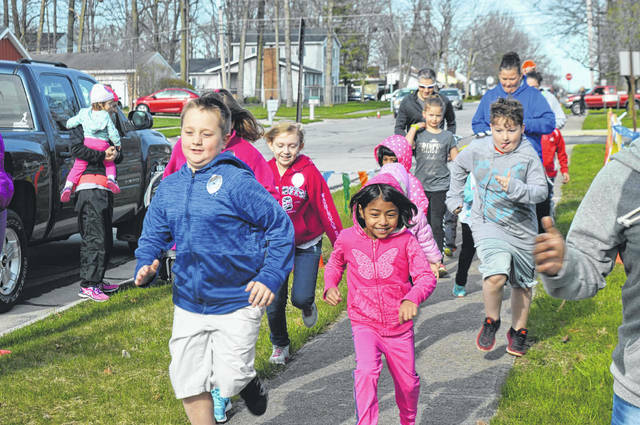 Children enjoy a fun run during the Sidney-Shelby County YMCA’s Healthy Kids Day in April. The YMCA has announced several upcoming programs, open to the public, aimed at ending childhood obesity. SIDNEY — September is Childhood Obesity Awareness Month, and the Sidney-Shelby County YMCA wants families to understand the dangers of childhood obesity and ways to reverse course through improved eating habits and increased physical activity. The YMCA, 300 E. Parkwood St., will host programs for children in grades kindergarten through sixth grade, Sept. 15, and for teens, Oct. 20, from 7 to 10 p.m. each night. Families will be able to participate together at the same time, Nov. 17. Parents must sign their children in and out for the Sept. 15 event. Named “Saturday Nite Live at the Y,” the evenings, supported by the Shelby County Community Foundation, are open to the public, not just YMCA members. Activities will include games like dodgeball and basketball, swimming, physically interactive video games and learning about healthy living, eating and lifesyle choices. According to the Centers for Disease Control and Prevention, the prevalence of obesity has remained stable at about 17 percent and affects about 12.7 million children and adolescents. Today, obesity affects one in six children and one in three are overweight, which poses greater risks for many health problems such as type 2 diabetes, high blood pressure, high cholesterol and some cancers. Here in Ohio, 15.9 percent of children and adolescents are considered overweight or obese, according to the Centers for Disease Control and Prevention’s Division of Nutrition, Physical Activity, and Obesity. The YMCA is helping families improve their health and potentially reduce the impact of childhood obesity through parent and child swimming and gymnastics classes, youth and adult sports leagues, and the Saturday Nite Live programs, which are new this fall. • Eat and drink healthy: Make water the drink of choice and encourage family members to fill half their plates with fruits and vegetables by offering two or three colorful options at every meal. As a family, choose a new fruit and veggie every week to taste together. Place a full pitcher of water on the table during meals and allow children to pour their own water. Keep full water bottles available in the car and backpacks. • Play every day and go outside: Children should have at least an hour a day of unstructured play outside (when possible) and break a sweat at least three times a week by getting 20 minutes or more of vigorous physical activity. Join children in games that get hearts pumping and bodies moving. • Reduce recreational screen time: Time spent in front of a television, computer, tablet, cell phone or video games should be limited to two hours or less per day. Make a family plan to reduce screen time at home, turn off screens during meals, charge electronics and screens in the kitchen overnight, go for a walk after a meal, set a timer to remind everyone to power down the screen. • Sleep well: Kids and adults need to keep a regular sleep schedule; unwind together in the evenings by reading a book or listening to soft music to ensure the body is preparing for sleep. Kids are growing and need 10 to 12 hours of healthy sleep per night. Adults need seven to eight hours of sleep. For information about the YMCA’s Healthy Living programs, call 492-9134 or email sluedeke@sidney-ymca.org.